The Atlantic Road is in the midwest part of Norway’s Atlantic coast and is one of the most scenic drives in the world. The road hugs the coast, right on the edge in some places. It is remote and rugged and in the winter months during storms the road will be under the waves crashing in from the north Atlantic. It has a roller coaster feel as you drive with dips and corners as well as very bendy bridges. It’s stunning views and wild location make it perfect for a wild weekend road trip. The road itself is short and can be underwhelming to some visitors. However, look at the landscape, look at the weather and look at the engineering involved in building eight bridges on a wild Atlantic coastline; this really is somewhere a bit different. Where is the Atlantic Road? The Atlantic Road is part of Norwegian National Road 64 (Rv 64), a very normal road until you reach this small 8 kilometre stretch. The construction of the road started on August 1983 and it took six years to be finished. Buffeted by 12 massive storms during its build, the 122 million Norwegian krone project is beautiful in a way only a road of this scale can be! It is made up of 8 bridges and has become one of the country’s most popular tourist attractions. It was designated a Cultural Heritage Site as well as being considered a National Tourist Route, and has been recognised as the Norwegian Construction of the Century. Quite a range of accolades for such a short piece of road. When it first opened on 7th July 1989 there was a toll, but since 26th June 1999 it has been toll-free. The road links the towns of Kristiansund and Molde, the two main population centers in the county of Møre og Romsdal in Fjord Norway. A brown sign approximately 30 kilometres southwest of Kristiansund just after a service station and small supermarket marks the start of the road. The end (or start if you are heading north) is approximately 47 kilometres north of Molde. The Atlantic Road, Atlanterhavsveien in Norwegian, is built on several small islands and is spanned by eight bridges and several landfills. The road twists and turns across the islands with panoramas coming and going. There are a number of stopping points with parking and refreshments. Don’t attempt to stop away from the parking places, it really isn’t worth it. At the stopping places take time to explore the landscape as well as the bridges. Nature and man really do merge in this landscape. This road remains open whatever the weather, but common sense should be exercised. Do not travel this road in severe weather conditions. It has a well-deserved reputation for being dangerous because of unpredictable snowstorms and blizzards, and driving under these conditions, can be extremely challenging. In storms, waves will break over the road at unpredictable intervals and visibility can be reduced to nothing. Winds are also a problem, Storseisundet Bridge, the highest is 26m above the ocean. When winds are blowing in excess of 30 miles per hour, you really don’t want to be up there, trying to drive. 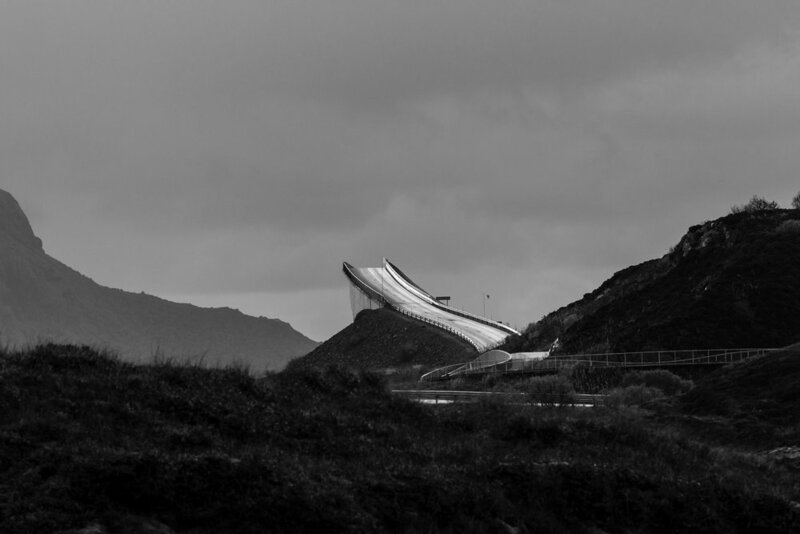 The Atlantic Road and the surrounding areas are made for photography. There are so many options that it is easy to find something. From the bridges (obviously), through to rocks on the beaches, fishermen on the bridges, wildlife, dilapidated buildings, the list is endless for such a small area. Venturing off the road and into the surrounding villages can also bring surprises with small churches and beautiful fjords. Take care when driving not to get distracted by the landscape and photographic opportunities. There are parking places and from here you can walk to find the composition you want. The parking places are in sensible locations and there are small paths away from the tourist zone to find something a bit different. Don’t be afraid to explore across the road from the parking. Storseisundet Bridge is beautiful when viewed from the parking at Kuholmen, peaking over the top of the surrounding trees and bushes. Without spending time just wandering I would never have seen this composition. As the Atlantic Road is so short there are limited options on the route. This is especially the case in the winter months where most places tend to shut down. We stayed at Hustadvika Guesthouse near Farstad. A small hotel on the shoreline with stunning views. In the summer there is a spa and restaurant but in winter this is all closed and the self catering chalets are the only option. These are cosy and warm whatever the weather. 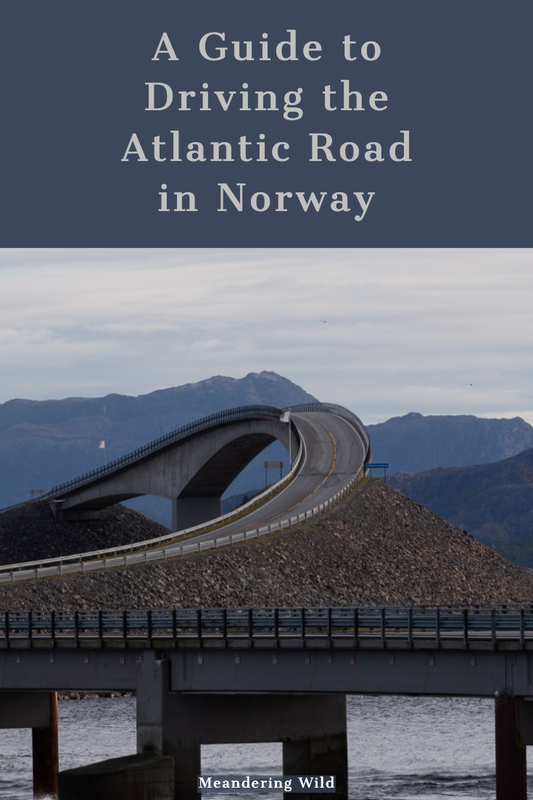 The Atlantic Road needs planning to explore. It’s not like lots of other places in Norway that you can get to on the way to somewhere else. The most cost effective way to get to the road is to fly into Trondheim and then take the 4 hour drive down. This 200km drive is impressive with a number of extensive tunnels, a ferry, small villages and beautiful landscapes to enjoy. It is an adventure in itself just driving to Kristiansund. Kristiansund has its own airport but flights are limited and can be expensive. The best way to explore the road is to leave Trondheim in the morning and wander down the coastline, arriving on the road mid afternoon. This means you get to see the road at sunset if the weather is cooperating. You can then continue to Molde or stay nearer to the bridges in Farstad. If you haven’t had your fill on the first day you can return in the morning for soft light and more photographs before heading back to Trondheim or on to another location (Smøla is the perfect detour on the way to Trondheim for a second night). Kvernes Stave Church was built in 1300AD and is one of the newer, but smaller stave churches in Norway. Storseisundet Bridge is the largest and most iconic of the bridges on the Atlantic Road in Norway. A cafe hidden in a wall on the side of a hill in Norway!